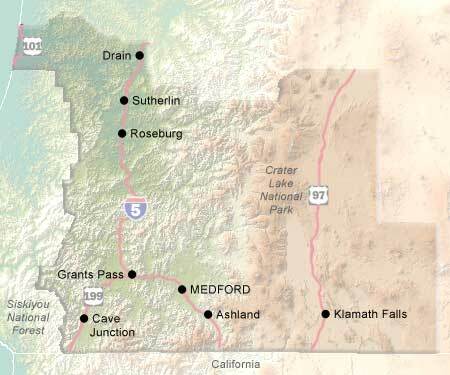 When Oregonian's talk about "Southern Oregon", they mean the inland southwest. As the shockwaves from the California Gold Rush spread through the West, prospectors entered Southern Oregon looking for, and finding, the prized mineral. Booms were followed by busts for decades. Fortunately, one town, Jacksonville, boomed but never quite busted. It remained without growing but without decaying into a ghost town and is today one of the region's foremost tourist destinations. Southern Oregon is booming again, with interest now fueled by its attractions as a place to live and the cultural activity represented best by the Oregon Shakespeare Festival in Ashland. SOVA, the Sothern Oregon Visitors Association, represents the visitor industry in seven Southwest Oregon counties: Coos, Curry, Douglas, Jackson, Josephine, Klamath, and Lake. For a FREE vacation guide to Southern Oregon, contact Southern Oregon Visitors Association.